This item is used to block or execute attacks. It is surprisingly strong and can hold up to blades striking it. It is only used when Mamoru is Tuxedo Kamen. 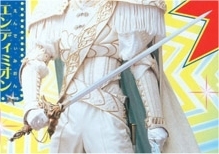 This item is used when Mamoru transforms into Prince Endymion. He is quite adept at it, and can use it to block or execute attacks. Usagi has also used this item, and with the help of Mamoru's spirit it was used to defeat Queen Metallia.